There are a couple of months to go until the wedding, and it's time to choose the wedding bands. Traditionally, the woman bought the ring for her future husband, but today many couples shop for bands together. Whether you are considering 18K gold, titanium, or platinum wedding bands for men, keep in mind that it should be durable, comfortable, and fit his personal style. Platinum wedding bands for men are very popular because this metal is durable, extremely long-wearing, and will stand up to rough treatment. Platinum is dense and heavy, much heavier than 18K gold, and very white. It will not scratch easily and will maintain its good looks through years of rock climbing, sports, gardening, tinkering with cars or whatever else a guy can get into. Unlike titanium, which is more durable still, platinum wedding bands for men can be cut off if necessary in an emergency. Some men balk at wearing a wedding ring because they are not used to wearing rings and are concerned that it will be uncomfortable. The comfort of a ring is determined by its shape. Avoid flat wedding bands with sharp angles because they can cut into the finger. Rings with gently rounded edges will be comfortable to wear. If your man likes sharp angles, consider a ring with the inside edge more rounded than the outside. The width of the ring can affect the comfort of the wearer as well. Platinum wedding bands for men tend to be wider than those for women, since men's fingers are usually larger around and longer than women's. Most men choose bands that are 6 - 7 mm wide, but men who like wide rings can sometimes order a slightly larger size to achieve that wide look and still have a comfortable fit. The style of a man's wedding band depends upon his personal taste, his interests, and his lifestyle. A wedding ring is something that will be worn everyday to work, so you want to choose something that fits his personality and also stand up to his regular activities. Many couples like braided wedding bands or rings with cut out designs, but these might not be a good fit with couples who get their hands in the dirt while they are gardening, or couples who like to cook or have a messy hobby, such as throwing pots. 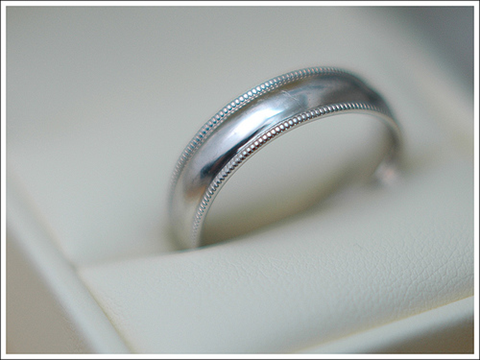 Platinum wedding bands for men can take a beating and still look great many years later. Some men prefer a very simple, plain band, while others like more intricate designs. The wide band with lines of braid along the edges is very popular. Platinum wedding bands for men can also be set with diamonds and other gemstones. The artisans at Juno Jewelry can create custom wedding rings for both the bride and the groom in your choice of metals. Your wedding ring represents eternal love that has no beginning and no end. Begin and end your search for the perfect wedding band at Juno Jewelry.